Following my enjoyable outing to Little Granite, I went back to Weaverville later that afternoon to find another high peak in the Trinity Alps that I could visit without snow. I hit upon Thurston Peaks North, the highpoint of Limestone Ridge in the western part known as the Green Trinities. In addition to being a P2K, it's on the CC list, possessing both criteria for peaks I've been visiting in the coastal mountains. The trail to reach it passes over Brushy Mtn, a P1K, which would make for an easy bonus. There were other named summits along the way that I could pick and choose depending on time and energy, a full day's agenda of some 25mi - perfect! I spent much of the evening driving west on SR299 to French Bar and then up the very long Forest Service road leading to the Green Mtn Trailhead. I was happy to find the road in decent shape and I was able to drive to within a half mile of the TH. My beta had foretold this so it came as no surprise. It was dark before I reached the end of the driveable portion at a wide saddle between Brushy Mtn and China Peak. Plenty of room for vehicles and camping. I did not get an early start the next morning, fog having kept the sun at bay without the expected sunrise that usually has me up. I had eaten breakfast, locked up the van and started shortly before 7:30a, first plying the road to reach the Green Mtn TH. It did not take long to rise above the sea of fog that had come in from the west, scattered summits poking up like islands in a sea of foam. There was a good deal of downfall on the trail which has not seen any maintenance this year (it was early in the season still), and possibly not for several years. About two miles up from the TH is the junction for Brushy Mtn, a 1/3mi side trip from the main trail before it starts a 1,000-foot descent. I decided to pay it a visit first because I didn't know how much energy I'd have on the return. This side trail was overgrown and mostly unused. As the name implies, trees give way to thick manzanita near the summit. Surprisingly, the very summit has some open areas with some vistas to the west and east. I looked around in the likely spots for a register but found none. Returning to the main trail, I began the long descent down to a saddle with the next summit in line, Green Mtn. Thurston Peaks can be seen as one drops off the NE side of Brushy Mtn. There are decent views of both Green and Brushy in the vicinity of this saddle. The trail begins a rising traverse along the SE side of Green Mtn, reach to Willow Gulch Creek and then following this up to Stove Camp. It was only one of two places that I found water on the day. Above Stove Camp the trail reaches a saddle NE of Green Mtn. A side trail, not as disused as the one on Brushy Mtn leads in 2/3mi to Green's summit, a small rock outcrop at the southwest end of the summit ridge. Some modest bushwhacking is needed to reach it. No register here, but nice views of Brushy to the southwest and Thurston Peaks/Limestone Ridge to the east. Other fine views looking west and north are not found at the summit, but rather on the trail leading to it. With the two bonus peaks dispensed with, I turned my attention to the main attraction, Thurston Peaks North, 3mi+ to the northeast. 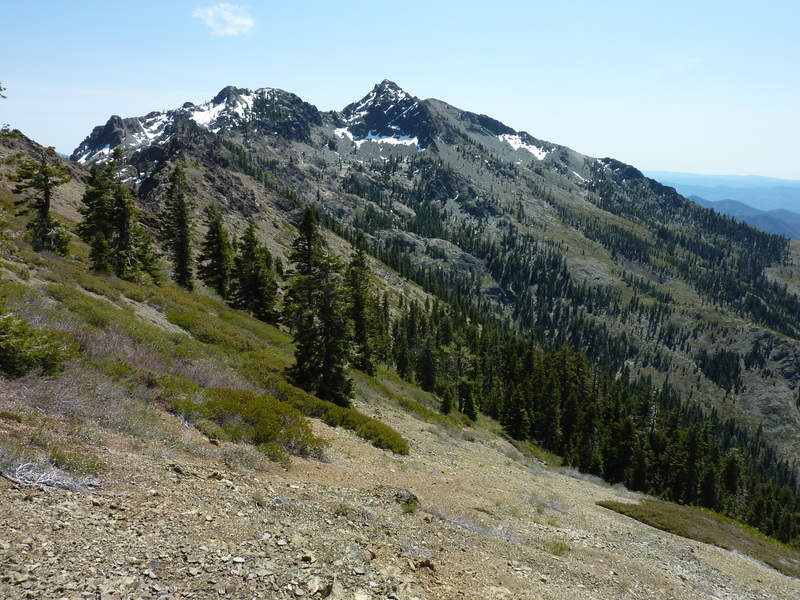 I returned to the main trail and followed the undulating ridgeline up and over three or four minor bumps to a saddle on the SW side of Thurston North. From this vantage one gets a sweeping view of Limestone Ridge from Pony Peak 2mi to the north to Thurston South the same distance to the SE. Here the trail traverses the west side of Thurston North on its way to Hangers Roost Camp and points north. I left the trail to begin the cross-country scramble east up the ridgeline. It was a decent enough climb, with some good class 3 if one sticks more to the ridge with easier class 2 lower on the south side. Much of the north side was sculpted cliffs with snow hanging on in places. The ridge leads to a lower summit south of the highpoint. 15min of easier scrambling leads to Thurston North. By this time it was 12:30p and I was doing well on time. I hadn't planned on doing Pony, but it was looking tempting as an additional bonus. I found the register left by Richard Carey and Gail Hanna in 2010 with five pages of entries. There were a few other highpointers like Ken Jones and Dan Baxter, Sierra Challenge participants Luca and Ephrat and a few entries from trail crew members. The views from the rocky summit are as expansive as one might expect from a P2K. The only higher peaks visible are the White Trinities to the northeast. In all other directions lay miles upon miles of folded landscapes, mostly forested, stretching as far as visibility allows. Once I decided I had the energy to head to Pony Mtn, I went about finding a more efficient way of getting there. Heading back to the trail the way I came was a little convoluted, hardly optimal. The best trick would have been to simply follow the ridgeline north from Thurston, but this was a tortured line of rocky gendarmes that would not only have taken longer but probably make me wet my pants, too. I chose instead to head directly down about 800ft of loose talus/scree on the WSW side. It would have made for a horrible ascent line, but not all that bad for a slip-sliding descent. I aimed for a white groove cut by erosion that had the only semi-solid rock I found on this side of the mountain. Below this was more loose crud, then into the trees and eventually on open slopes of an easier gradient covered in low, ankle-high brush. More trees followed before stumbling upon the trail about where it was shown to be on the GPSr. Not far north on the trail I came across the second water source, the headwaters of Devils Canyon. Somewhere around here is the site for Hangers Roost Camp, but there were no signs and no flat spots that I observed. The trail continues north on a traversing climb of about a mile before making a few hard-to-follow switchbacks up a sandy slope before reaching the crest of Limestone Ridge at a saddle above Pony Camp and SE of Pony Mtn. Once again I left the trail for some rocky scrambling, taking about 20min to reach the top of Pony Mtn. A much easier deal than Thurston, but still worth it. Views are as open and fine as those on Thurston. I found the register jar placed upside down, allowing water to get in. The pages were all damp, so I left them out to dry some in the sun. Only one had something written on it, and this only a year old. When I realized the other pages were blank and they weren't going to dry out before I grew cold sitting there, I gathered them up to stuff in my pack and left a dry notepad I happen to have with me. I and Ephrat left a register on pony mountain in 2011. Sad to see it's gone! I think the pages you found are unrelated to what we left (it was a small book if I remember correctly). But I did note your names in the nearby Thurston register! - good to hear from you, Luca!